Microsoft’s release of Azure Stack, an on-premises version of its public cloud, could be important for networking and data center pros for one simple reason: It gives customers a way to use a popular and familiar cloud platform without shipping their sensitive data into a multi-tenant environment. Azure Stack is software from Microsoft that’s been certified to run on a select group of partners’ hardware and is intended to look and feel just like the Azure public cloud. In addition to providing a common management platform between the public and private cloud, Azure Stack is important for another reason too: none of Microsoft’s biggest public cloud competitors have anything like it. Microsoft is the first of the three major IaaS vendors – Microsoft, Amazon Web Services and Google Cloud Platform – to offer a hybrid cloud that consists of an on-premises hardware/software bundle that runs the same software management tooling as the public cloud. After first announcing plans for Azure Stack in 2015, Microsoft this week announced that the offering is finally available for customers to order, with shipping expected by this fall. Leong expects this could be beneficial for customers who want to use Azure but some reason such as regulations, data sensitivity, or location of data prevents them from using the public cloud. If a customer has sensitive data they’re not willing to put in the public cloud, they could deploy Azure Stack behind their firewall to process data, then relatively easily interact with applications and data in the public cloud. Vijay Tewari, Group Program Manager for Azure Stack says other initial use cases revolve around using Azure Stack as an “edge” of the Azure public cloud. For example, Carnival Cruise Lines, an early user of Azure Stack, may not connect their ships to the public cloud while in the middle of the ocean. Azure Stack can be used as a private cloud on the ship, then when in port, data collected on the ship can be uploaded for processing in the Azure public cloud. Sometimes the limiting factor for an app moving to the public cloud is not the app, but rather the data the app needs. With Azure Stack, customers can bring the cloud to the data, allowing users to run an Azure front-end that can access sensitive back-end data. Microsoft is very clear about what Azure Stack is not too. It’s not a standalone advanced virtualization platform. There are many non-cloud native applications – perhaps legacy ones, third-party software, or ones highly tuned for specific use cases – that do not fit the model of running in a cloud. Azure Stack is not meant for those, Tewari says. Microsoft offers other platforms, including Hyper-V based Microsoft Systems Center and Windows Server 2016 for these use cases. Azure Stack is made of two basic components, the underlying infrastructure that customers purchase from one of Microsoft’s certified partners (initially Dell EMC, HPE and Lenovo) and software that is licensed from Microsoft. The software includes basic IaaS functions that make up a cloud, such as virtual machines, storage and virtual networking. Azure Stack includes some platform-as-a-service (PaaS) application-development features including the Azure Container Service and Microsoft’s Azure Functions serverless computing software, plus MySQL and SQL Server support. It comes with Azure Active Directory for user authentication. Customers also have access to a wide range of third-party apps from the Azure Marketplace, including OS images from companies like Red Hat and SuSE, and templates that can be installed to run programs like Cloud Foundry, Kubernetes and Mesosphere. On the hardware side, Azure Stack runs on a hyperconverged infrastructure stack that Microsoft and its hardware vendors have certified. The smallest production-level Azure Stack deployment is a four-server rack with three physical switches and a lifecycle management server host. Individual racks can scale up to 12 servers, and eventually, multiple racks can be scaled together. Dell EMC, HPE and Lenovo are initial launch partners. Cisco plans to offer a certified Azure Stack platform based on its UCS hardware line by the end of 2017 and Huawei will roll out Azure Stack support by the end of 2018. IDC Data Center Networking Research Analyst Brad Casemore says he believes customers will need to run at least a 10 Gigabit Ethernet cabling with dual-port mixing. Converged network interface cards, support for BGP and data center bridging are important too. 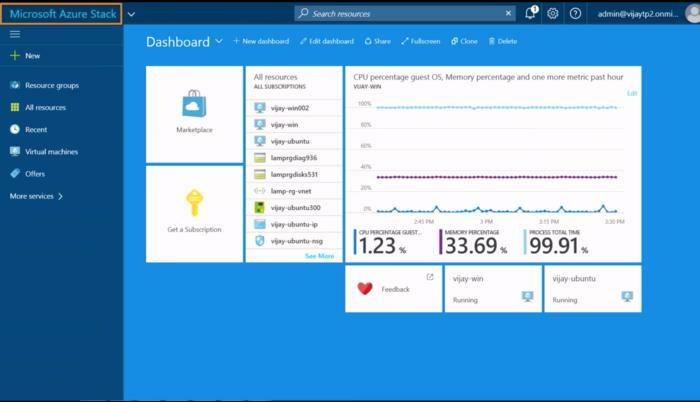 Microsoft estimates that a full-sized, 12-rack server unit of Azure Stack can supply about 400 virtual machines with 2 CPUs and 7 GB of RAM, with resiliency. Microsoft is offering multiple consumption models for Azure Stack. A software-only Azure Stack Development Kit (ASDK) is available now and is meant to be trial software for proof-of-concept purposes. The combined hardware-software offering is named Azure Stack Integrated System and in this model customers buy hardware from one of the certified vendors (Dell EMC, HPE or Lenovo) and license the Azure Stack software to run atop it. Customers can also use a managed hosting partner or outsourcing vendor that would run the infrastructure. Rackspace is one of the first to offer this, but many other Microsoft partners are expected to offer Azure Stack in this model. Microsoft offers two primary ways to buy the Azure Stack licensed software. One is a pay as you go model in which customers pay based on how much they use the infrastructure and software. In this model, a base virtual machine starts at US$6/virtual CPU/month; Azure Blob Storage is $0.006/GB/month. Azure App Services, such as API, Web, Mobile and Azure Functions services are $42/vCPU/month ($0.056/hour).There are no upfront costs for the software and customers only pay for how much of the software is consumed. The other option is to pay a fixed annual subscription starting at $144 per core per year, ranging to $400 per core per year, which includes higher-level application services. Customers can use their existing Microsoft licenses, including those for Windows Server, SQL Server and MSDN subscriptions to pay for Azure Stack. Various channel partner licenses agreements can also be accepted. Updates to the Azure Stack software will not have a regular release schedule; they are pushed to customers whenever they’re ready, similar to the model in the public cloud. These updates will be automatically downloaded onto the Azure Stack software to keep it consistent with the Azure public cloud and customers have a choice of when they want to install them. Microsoft will also push a series of monthly security updates. Azure Stack is fairly unique in the market. AWS and GCP offer customers hybrid cloud computing platforms, but they’re not a full-fledged private cloud offering that’s deeply integrated with their public cloud. AWS’s storage gateways allow customers to prepare data on their premises for upload into the AWS cloud. AWS also offers Snowballs – which are ruggedized 40 or 80 TB storage devices that run some basic compute functionality – named Greengrass- that can serve as an “edge” of AWS’s cloud. They’re meant to be loaded up with data that will eventually make its way into AWS’s public cloud. AWS also has a partnership with VMware the companies launched in 2016 that allows customers to run most VMware management software in AWS’s cloud. So, theoretically customers could connect their VMware-based on premises workloads with the same VMware software in AWS. Google recently announced a partnership with Nutanix, the hyperconverged infrastructure vendor, to offer unified management of Nutanix and GCP resources, and backups of Nutnaix workloads to the public cloud. This partnership is meant to provide some hybrid cloud management across on-premises environments and the public cloud. Google says many of its software platforms, such as the Kubernetes container orchestration software can run on premises and in the cloud. There are other options. Red Hat has management software for virtual machines, containers, applications and middleware that run both on customer premises and in many public clouds. Pivotal, the company that commercializes the Cloud Foundry open source PaaS software, does the same and integrates across multiple public cloud endpoints. Management tools like RightScale can control infrastructure across multiple on premises and public cloud endpoints.